This year’s conference is going to be from May 25 to 27 at the Wyndham Riverfront Hotel in North Little Rock. Your sponsorship would allow a great opportunity for exposure to our statewide network with on average over 200 attendees from across the state, including some of our national partners as well. 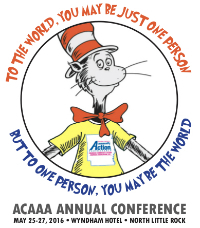 2016’s theme centers around a famous line attributed to Dr. Seuss — “To the world you may be just one person, but to one person, you may be the world” — which we feel gets to the heart of Community Action’s charitable spirit and how it does act as positive agent for change.